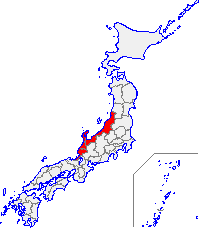 Of these, Niigata is the largest with a population of over 800,000. The main industries in the Hokuriku area include chemicals, medicine, tourism, textiles and textile machinery, heavy machinery, farming, and fishing. Koshihikari, a popular variety of rice is a special product of Hokuriku region. 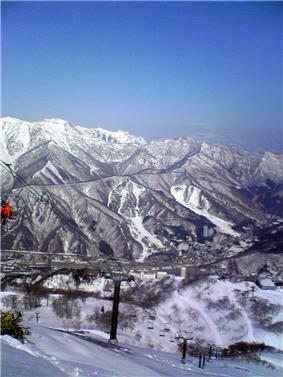 The Hokuriku region has the highest volume of snowfall of any inhabited and arable region in the world. This is because dry Siberian air masses, which develop high humidity over the Sea of Japan, are forced upwards when they encounter the mountains of Honshū, causing the humidity to condense as snow. The long winters and deep snow of this region are depicted in Hokuetsu Seppu, an encyclopedic work of the late Edo period which describes life in the Uonuma district of Niigata Prefecture. 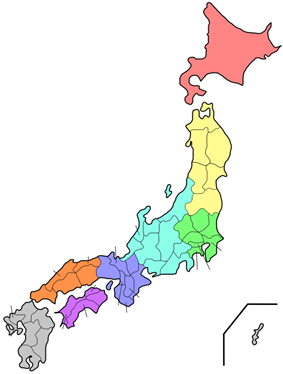 The Hokuriku region is also the setting for Yasunari Kawabata's novel Snow Country. ^ Nussbaum, "Hokuriku" at p. 344, p. 344, at Google Books. Nussbaum, Louis-Frédéric and Käthe Roth (2005). Japan Encyclopedia. Cambridge, Mass. : Harvard University Press. OCLC 58053128. ISBN 0-674-01753-6, ISBN 978-0-674-01753-5.